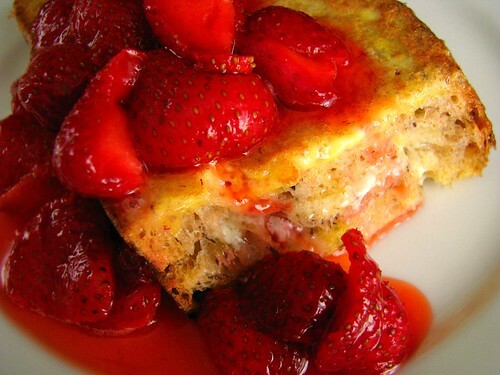 mascarpone-stuffed french toast, originally uploaded by Rcakewalk. Day two of operation Use Mascarpone Cheese: Stuffed French Toast. Lo gave me the idea, and what better thing to do with this stuff than eat it for breakfast? I took one slice of Lahey bread, cut in half, and spread about a T. of mascarpone in the middle. I made two sandwiches, so I used 2 beaten eggs for the dip. Let them soak up the egg well, about 30 seconds per side, before sizzling them to golden brown seduction on a hot buttered pan. I was surprised at the clarity of mascarpone in this! It was melted into the bread, and not heavy or overdone like restaurant stuffed French toast, since I used such a small amount. In fact, I've been making the Lahey bread with flax meal and whole wheat flour (thanks in part to Deborah at Loop! ), so the whole breakfast was rather nutritious, if I do say so myself. My Husband liked it too, so I'm counting it a double win! Thanks, Lo!